Here, Riviere is referring to a ceiling by Giovanni Battista Tiepolo dated around 1754 -8 which was originally in the Palazzo Contarini. 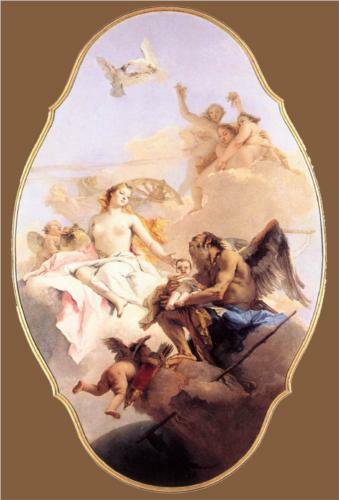 Titled An Allegory with Venus and Time, the ceiling may have been commissioned to celebrate the birth of an heir in the family, as in the painting, Venus is handing a little boy to the figure of Time. The ceiling was acquired by the National Gallery of London in the late 1960s.